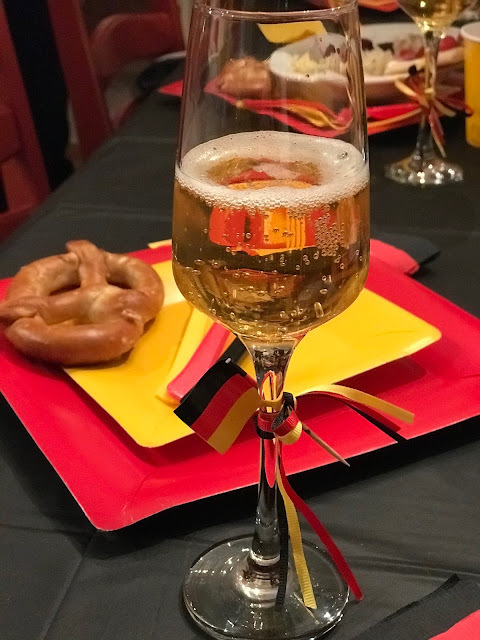 When my friend Colleen offered to host a birthday party for our friend Annemarie, she chose a German menu and décor. 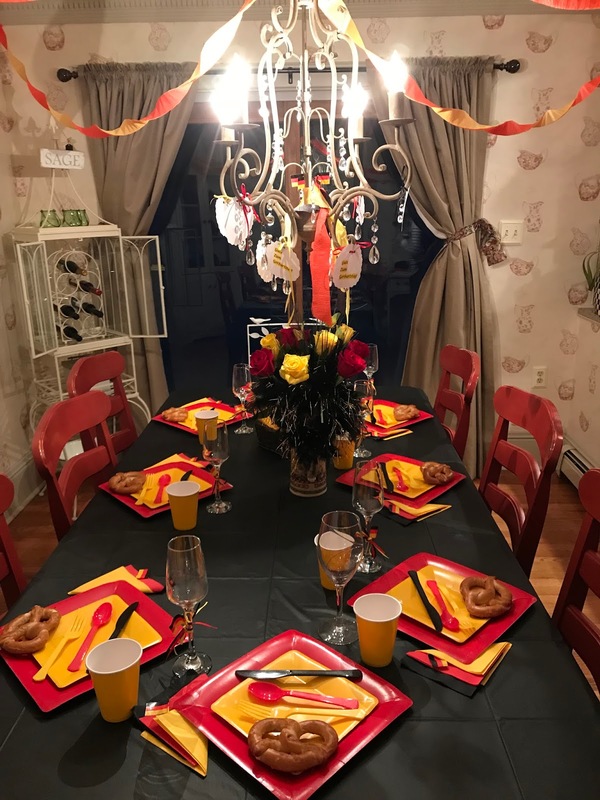 Annemarie has lived in the USA since she was 19, and Colleen felt she would enjoy a “theme” from the country she grew up in. The theme definitely surprised her! 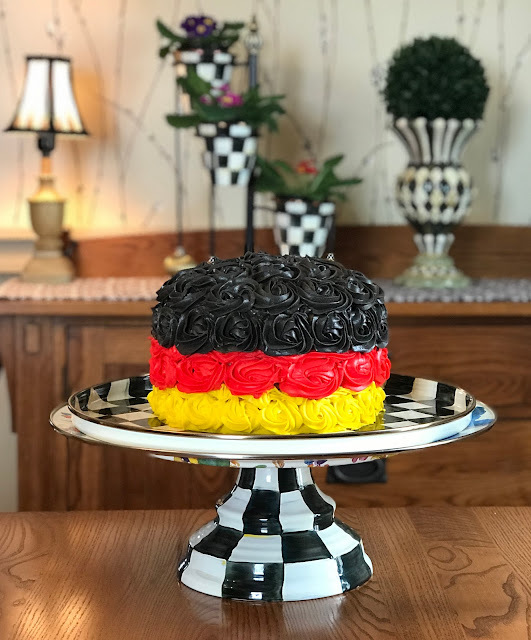 Colleen had shown me a picture of a Germany themed cake she found on Pinterest. The flag is black, red and yellow so I used those colors. I made two boxes of cake batter using my favorite cake mix, Aldi’s Classic Yellow Extra Moist. I love how moist and how flavorful it is, and all the ladies commented on how good it was. I scooped out 2 cups of batter into four 8” cake pans that I lined with parchment paper. I cut parchment circles to fit in the bottom of each pan, and didn’t use anything else. No Pam, no flour. Once the cake was baked, I ran a sharp knife around the edge to loosen it, and let it cool for 10 minutes. Turned it upside down on a cooling rack, removed the parchment paper, and it came out perfectly. I learned this trick from a blogging friend Jackie. Thanks Jackie! Once I tinted the frosting, I filled three 16” disposable Wilton decorating bags. I used three colors, black, red and yellow and used a 1 M decorating tip. Thankfully we have a wonderful baker in the family that loaned me some of her cake making supplies. roses would be firm and not slide. Once the cake was done I put it in the fridge until it was time to transport to the party. I got lucky and found the perfect size large box in the attic to transport the cake. The cake was a joint effort. Thanks Joe for the help! I found out my hubby is very good at helping with cake decorating. Once he was done, he grabbed his chainsaw and helped a neighbor with a river birch tree that was damaged by the heavy snow from the winter storm the day before. He was more in his element outdoors, but I think he even shocked himself (and me) helping with the cake since I was in a hurry. There were 8 of us there and we played a German game which would also be fun for my grandchildren once they are older. I can't recall what the German game was called, but we were blind-folded, and given a wooden spatula. The hostess placed a small metal mixing bowl on the living room rug with a small prize under it, and we had to try to find and hit the bowl with the spatula to win the prize. Thankfully we all (still) have good knees to crawl! Wow, your cake is beautiful! And so is your table. The game sounds fun, too. :D Are you expecting tons of snow this week? Gorgeous cake ! !Love it and tell me about the barn sale at Mackenzie Child's , I seen it on your header. I LOVE a themed party! 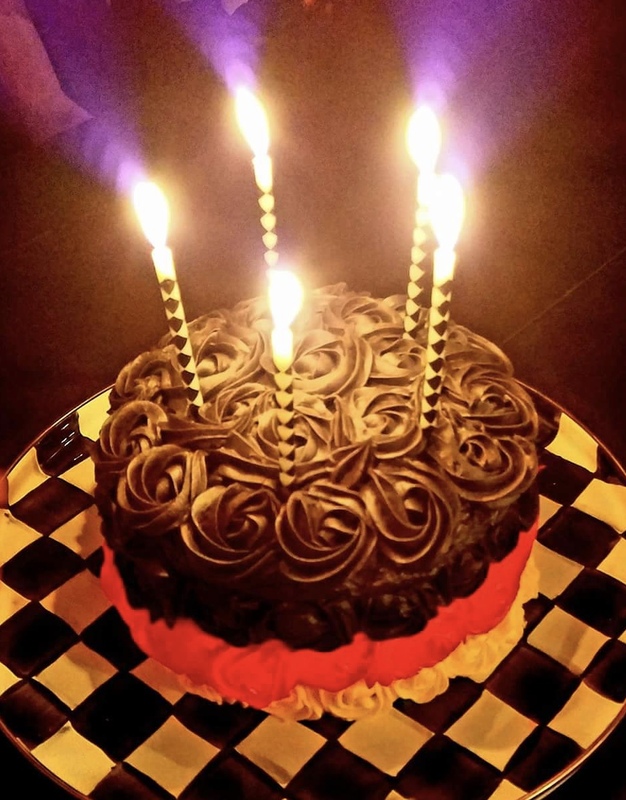 Everything looks perfect, especially your cake! THe cake turned out great. When you said, "once he was done, he grabbed his chainsaw..." I had to chuckle. I knew the rest of the story from your FB post, but it still gave me a humorous visual of him cutting the cake, lol. I have seen cakes with those big fat roses on Pinterest and they are so stunning, what a grand job you and Joe did on this masterpiece! I know the birthday girl must have been thrilled and impressed! Yes, we learned that you need to refrigerate the cake between roses and after frosting the hard way! They are just so heavy they want to slide. But it really is so pretty that it is our go to cake. I love the pretzels on the plates. What an honor for your dear friend. I bet she loved it! What a beautiful cake, your friend must have really enjoyed her birthday.